It’s a crisis point in history for Native American languages. Without a concerted effort to revitalize them, many will soon go extinct, succumbing to the generations-long effort to destroy them. 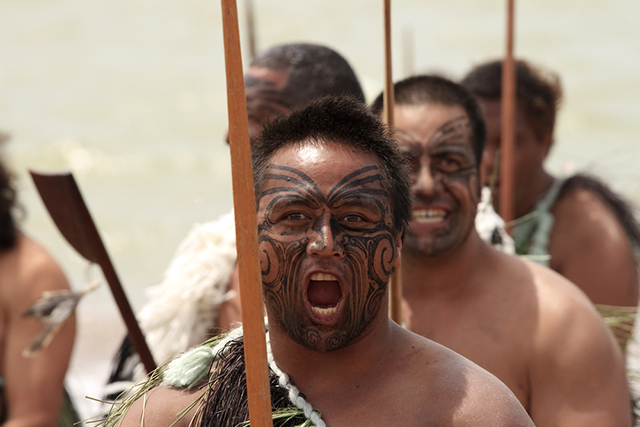 The Maori people of New Zealand are one of many groups that have struggled against the violent effects of colonization on their languages. In 1840, the Maori came under the rule of the British Crown as more and more European settlers arrived and more land was needed to accommodate them. Land conflicts eventually broke out into all-out war, ending with huge tracts of Maori land being confiscated by the government. Displacement, poverty and racism became commonplace. Their struggle now reflects that of other Indigenous peoples and nations across the globe fighting to preserve their knowledge, culture and traditional way of life. Hana O’Regan is Ngāi Tahu, Maori. She is the director of Maori and Pasifika and director of student services at the Christchurch Polytechnic Institute of Technology in New Zealand. Her great grandparents were fluent Maori speakers. They never passed it down to her grandmother. Determined to reverse that trend, O’Regan began learning Maori at the age of 13 as a second language. She then taught her children Maori as a first language. Nothing illustrates the difference between learning Maori as a first or second language more than a story that O’Regan told Truthout about a powerful earthquake striking her hometown of Christchurch in late 2010. As the powerful earthquake struck the beach where O’Regan and her family live, her son surprised her by grabbing onto her shirt as the ground shook under their feet. He shouted, “Mom, please pray to Ruaumoko!” In Maori mythology, Ruaumoko is the god of earthquakes and volcanoes. “What’s at stake is not just the preservation of a language but a way of thinking and seeing the world around us,” O’Regan said. The Lakota Language Nest Immersion School (Lakȟól’iyapi Wahóȟpi) represents another instance of resistance to the colonial legacy that threatens many Indigenous languages. The school is a growing Lakota language program for children beginning at age 3. The school, located on the Standing Rock Sioux Tribe Reservation in North Dakota, is struggling to find ways of staying open as initial grants are set to run out. As Truthout has reported, Tipiziwin Tolman is a Lakota language activities instructor at the school. Tolman’s family has a long history with the Lakota language. She recently learned that her great grandfather, Joseph Pretends Eagle Sr., was a Lakota code talker and Silver Medal recipient during World War I, transmitting coded messages in his native tongue about troop movements or positions that were virtually impossible to break. While they had always known that Pretends Eagle Sr. was a veteran of the war, his role in using his traditional Lakota language to fool enemy troops was a secret he kept only to himself until his death. Recently released government documents revealed that Pretends Eagle Sr., along with many other Lakota warriors, played that role during the war. Despite the contributions to the United States from many native families such as Tolman’s, keeping traditional Lakota knowledge and identity alive is a constant battle against US government policies created to oppose it. For example, Christian boarding schools received mandates to take thousands of Native children as young as 5 years old from their homes and families, tortured and abused them, and forced them to worship as Christians, all in the name of “saving” them. Other policies that Tolman mentioned included the banning of spiritual ceremonies in the past and the blood quantum law, which was designed by European colonists to determine who was to be considered Native American and who was not. If your blood did not measure sufficient generations of native bloodline, a certificate would not be granted. Today, the amount of blood quantum needed to be enrolled in a tribe varies from nation to nation. Executive director of the film, Wil Meya, is the cofounder of the Lakota Summer Institute and executive director and cofounder of the Language Conservancy and the Lakota Language Consortium. He has been working with Indian communities for the last 25 years. The film’s screenings have already served as an inspiration to many other Native nations and language learners throughout the country. This article first appeared on truthout.org on August 21, 2015. © Truthout. Reprinted by permission.